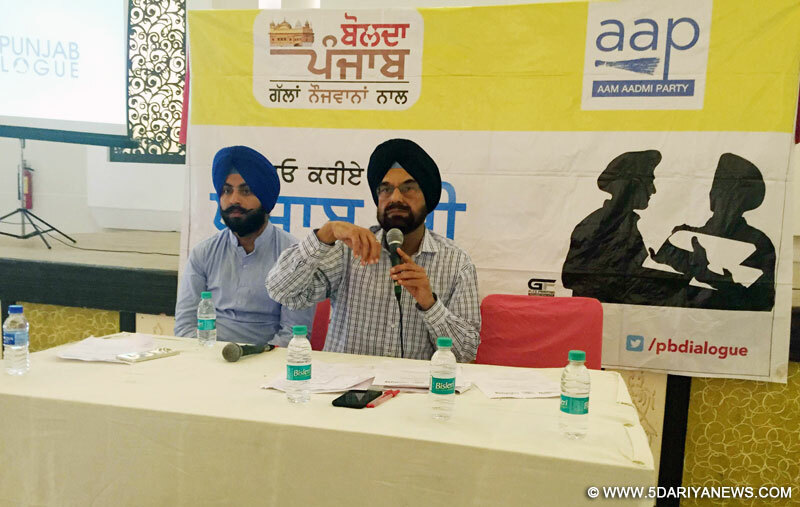 In an on-going process of Punjab Dialogue with youth by Aam Aadmi Party (AAP), growing network of unscrupulous travel agents, unemployment due to lack of service industry and ‘Goonda Tax’ being imposed by Akalis emerged as key issues concerning youth of the state. Head of the Punjab Dialogue Kanwar Sandhu along with Senior party leader from Delhi Ashish Khetan, Head of Youth wing of the party Harjot Bains and Senior leader Chander Suta Dogra initiated dialogue with youth of the Malwa region at Park View Resorts here.While opening the Dialogue, Sandhu and Khetan apprised the gathering with the motive of Punjab Dialogue and said that it is a process to identify the issues with its possible solutions concerning youth, so that a Comprehensive Policy could be chalked out for its implementation in transparent manner after the formation of AAP’s Government in Punjab.“We don’t want to impose our agenda on you, rather it is you, who will set the agenda of your government in a true spirit of democracy i.e. a government of the people, by the people and for the people”, Sandhu said. Like in the other sessions of Punjab Dialogue with Youth in other districts, unemployment, poor education system, deteriorated law & order situation and lack of industrialisation were the key issues concerning the youth of Punjab.Here in the Malwa region youth also emphasised on the issues of Mafia Rule by Akalis, loot of youth by unscrupulous travel agents and lack of service industry in the state, as their other areas of concern.Jaswinder Singh from Lambi village pointed out that private engineering colleges have opened at every nook & corner of the state, but Akali Government never thought where engineers of these colleges would get jobs as there is virtually no service industry in the state.Lack of job opportunities in Punjab forced youth to inspire for foreign dreams and ultimately they left ‘cheated & looted” by the unscrupulous travel agents, who dupe them by showing their green pastures on the foreign land, Jaswinder added.Another youth, Mangat Kumar from Rampura Phool said that as most of the key businesses like Cable, Transport, Sand, Land, Liquor and real estate are being ruled by Mafia under patronage of Akalis, youth of the Punjab turned frustrated and sucked into drug-abuse and incidentally this ‘drug’ trade is also being run by the Akalis. Amarinder Singh from Goindpura also raised the issue of corruption in the recruitment process for government jobs and rued that only those youth, who are having affiliation with the Akali Dal are getting government jobs. While taking note of the issues raised by the youth, Kanwar Sandhu said that AAP is committed to eradicate corruption from the state, which is root of every sin of Punjabis. “There is a need of political will to curb corruption and AAP has already proved its mettle on this front by running a transparent government in Delhi”, Sandhu added.Correction in the Education system by making it job-oriented, eradication of menace of drug-abuse, development of service industry, industrialisation to create more jobs and bringing agriculture reforms would be the priority of the upcoming Punjab Government of Aam Aadmi Party (AAP), Sandhu vowed.Ashish Khetan claimed that after formation of AAP Government drug-abuse would be wiped out from Punjab within three months by putting all drug suppliers behind bar.